Love them or hate them, numbers are all around us. 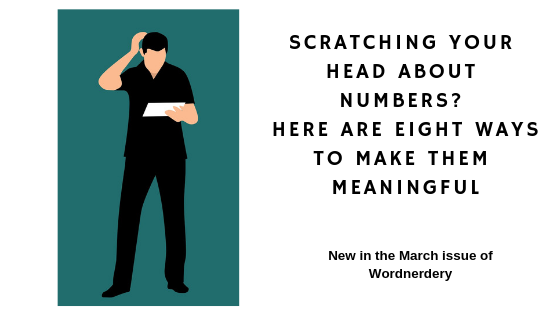 Whether numbers mean anything to your reader or not often comes down to how well they are explained. I recently ran across Making Data Meaningful (pdf), a guide designed to be “a practical tool to help managers, statisticians and media relations officers bring statistics to life.” Issued by (surprise!) the United Nations Economic Commission for Europe, it includes input from Statistics Canada, the U.S. Census Bureau and other stats-keeping bodies. Read seven more tips in Wordnerdery. Wordnerdery is a quick read about words, effective/expressive writing, newsletters and more. Are you a subscriber yet? If yes, thanks for reading! If not, you can sign up right now. In keeping with Canada’s anti-spam laws and just plain good manners, you can easily unsubscribe any time.